This one’ll upset some folks since Russell Ackoff will be very well known to them. But I justify my inclusion of him as a lesser known hero on the basis of that modern litmus test (forget academic citations) of the number of Google hits on his name. So on that facile basis he’s about 4% as well known as W Edwards Deming. I suppose my other – entirely subjective – criterion is that Ackoff was unknown to me until a year or so ago. When I discovered him I was bowled over by the sheer humanity of the man. I first came across Ackoff through an archived webcast of a talk he’d given back in 2000 on systems thinking and youth justice to a workshop associated with the improbably-named Girls Link group at the Kent College of Law in Chicago. The video’s not brilliant technically. But it’s worth viewing. It covers many of the ideas he developed over a lifetime (he sadly passed away in 2009 aged 90). Ackoff began his working life as an architect and said that architects were – had to be – systems thinkers. They don’t design, say, houses by starting with individual rooms, designing each perfectly and then finding a way to join them together. They start with the building and then find out how to fit the rooms into the overall space and shape. They use (my words) an iterative process to get the best fit of the different elements. That’s systems thinking – and systems design. He was interesting on the difference between errors of commission and omission – how the former were easy to know (and assign causes to or, too often, blame for) whereas the latter were unknowable and therefore unmeasurable. In typical organisations managers avoid being blamed by avoiding errors of commission. And the easiest way not to make errors? Do nothing. Yet we only learn by our mistakes. So how can such organisations learn? He also said there are five types of “content” – data, information, knowledge, understanding, and wisdom. The first four are all concerned with increasing efficiency, only the last is concerned with effectiveness. One of Ackoff’s major insights for me was his use of systems thinking to throw light on social issues wider than how any single organisation works. He said that almost every major social problem is the consequence of doing the wrong things righter, in his own country (the USA) citing the health (sickness) care system and education – “teaching is a major obstruction to learning”. These are major social systems “pursuing objectives contrary to their intention”. He wrote extensively about his idea of idealised design – that in improving a system you should start from first principles, work out what your idealised design would be and then take steps towards it. As always with these pen portraits, there’s a lot more that could be written and I’d love those who understand Ackoff better than me to add their own thoughts. The other thing I’ve discovered is the love and affection Russell (“Russ”) Ackoff inspired amongst his many colleagues, students and clients. That doesn’t happen by chance. I wish I’d had an opportunity to know him. My thanks to Susan Ciccantelli for commenting on a draft of this post. Her kindness reflects that of Dr Ackoff. The conclusions are of course mine. I promised some off the wall stuff when I started this blog and with summer coming on I feel the urge again. …for every Eddie we clocked on the journey to the tunnel there were 2, 3 even more Norberts on the autoroutes with their unmistakable red livery and ND logo. It was the name that alerted us. What a cracker. Norbert. NorBERT not Norrbearr. Dentressangle. DEN-TRESS-ANGLE not Dongtrayssongl. It was important to anglicise the beasts to maintain some sort of illusory control over them. We got the kids to count them. For a while the competition took the pressure off more labour-intensive forms of distraction. A moment of nirvana was reached when we passed a Norbert depot somewhere south of Dieppe and there was a rush to tot up the serried ranks of red Renault trucks inside. Alas, time has devalued the exotic sport. 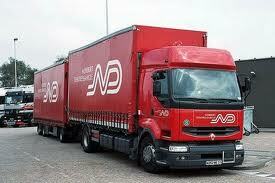 Several years later I spotted my first Norbert on a British motorway and now they’re ten-a-penny all over the UK. They’ve even spawned Stobart-like devotion amongst fans like the Wrinkled Weasel from Edinburgh (a Google search throws up another 87,799 hits). Norbert’s company even has a web site with an English language option. Not many public agencies can beat that (not sure what it’s got to do with delivering groceries though). PS – Norbert spotting was eventually replaced with caravan name spotting and if Norbert’s worth a para. or two, caravan names are worth a PhD thesis – in psychology. What a wide and wonderful world is systems thinking even in a relatively small country like Scotland. The brand new Institute for Socio Technical Complex Systems at Strathclyde Uni hosted an open and exploratory workshop on the subject on Friday 23rd. Coming up for 30 delegates gave their own take on what systems thinking means to them. the application of systems thinking to contact centres. agreeing a purpose for those exchanges. So no difference there between a wide ranging discussion on systems and any other area of life! Both this week’s Municipal Journal and the polemical Liberal Conspiracy web site have thrown more light on the Treasury’s Spending Challenge– see my various posts on Vote for lean thinking in government, If a web site gives up is it a sign of success?, Bad practice in government, and HMG web site in transition (thinks – am I getting obsessed with the subject?). I didn’t know whether to tag this entry under lean thinking, off the wall, or two new tags I’ll resist adding – weird and sad. I think the story could qualify under all four. The site has been reined in because it has been bombarded with a mixture of ideas, many of which were at the plain nasty end of the spectrum – how to “deal” with immigrants, un-married mothers, benefits “scroungers” etc etc. MPs’ housing allowances to be replaced by tents. It does all suggest the creation of the site was a bit of a rushed job (shouldn’t have been since public servants had already had six weeks to contribute to a similar site before this one went public). Perhaps HM Treasury also need to learn a bit more about moderation of public forums. Once they get rid of the vicious and weird let’s hope the serious suggestions do emerge in public. Otherwise the whole exercise will have failed even the most basic test of consultation standards. In an idle moment I was pondering the question of what’s the best meeting I’ve ever been to. That led me to thinking about the worst meeting, so here’s my starter list of both. Why not add your own? Who knows – thinking about why these were the meetings from heaven and hell might prompt thoughts about what made them that and how we can encourage the one and avoid the other. …one reported to me with some emotion by a colleague from elsewhere as the best moment in his public service career was the CE of a failing organisation who began its transformation by launching his commitment to 3,000 staff invited to an exhibition centre and saying with great honesty to them “We are failing. I know it and you know it. We have to change. Here’s what I want to do. Will you help me?” To reinforce what they had to do everyone was given a small bag of Quality Street (get it?) chocolates when they left. …any meeting lasting longer than two hours in a room with no windows. I’m keen to promote discussion (and my own understanding) so just a brief reminder that comments are always welcome on any aspect of the HelpGov blog. If you’re on the home page just click on Leave a comment at the top of each post. If you’ve come in via a particular post you can find Leave a reply at the bottom of the page. Finally, if you dive in via the About page you can also Leave a reply there. I moderate replies but only to guard against abuse (none so far – phew) or spam. “In transition” is one of the rich lexicon of euphemisms used when hitherto unexceptional employees are made an offer they can’t refuse. It used to be called gardening leave. The UK government’s Spending Challenge web site seems to be in transition following its earlier problems. But to what? Well, the government can’t be responsible for the sad souls who find fun in that sort of stuff but it makes it impossible to see how the suggestions are going (I don’t like “which we may publish at a later date”). With a bit of luck their tecchies (consultants to a man and a woman I’ll wager) are working on the problems even now. Let’s hope the site’s in transition to restoration of its interactive features.